Making bacon for a crowd? Find out how to make a big batch of bacon in the oven. With this method you get it nice and crispy with very little effort. 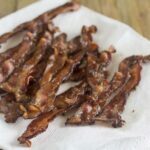 Easy crispy bacon – who doesn’t love that? I’ve been making bacon in the oven for a long time now. 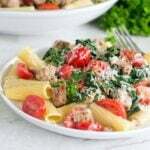 It’s so much easier than on the stove, and you can do a larger batch at a time. The only issue I’ve ever had is that it doesn’t always get crispy enough. I decided it was time to figure out exactly how to get nice crispy bacon in the oven. First of all, you need to start with the right kind of bacon. In this case, it’s the thickness that matters. You don’t want a really thick cut because it will retain quite a bit of chew no matter what. If you like that chew, go for it. If you’re looking for crispy, don’t. Also, don’t choose a really thin sliced bacon. This tends to break up and stick to the pan in weird ways. Instead, choose a medium cut. Not sure what to look for? When in the grocery store, hold up the packets of bacon sideways so you can see how thick they’re sliced. Compare a few brands and choose the middle one, it’ll be a tad under 1/8 of an inch. Another way to spot the right thickness is to count the slices in this isn’t foolproof since some bacons aren’t as long (center cut is shorter). but if you’ve got full-length slices, then you want about 18 slices in your 1 pound (that’s a 16 oz.) package of bacon. Second, use a fairly hot oven. For whatever reason, I used to do my bacon at 350°F. Switching to 400°F made a big difference in how crispy it gets. Note that 450°F was too high and parts of the bacon burned before others crisped up. Third, use a nice large baking sheet (this is what’s called a “baker’s half sheet pan”), or use two. You don’t want the slices overlapping much so that hot air can get to each one. 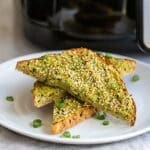 Another reason for not wanting the slices to overlap is that they will stick together as they cook and then break when you try to separate them. The pan below is probably as full as you want to get. I fit the entire pack of bacon onto the one half sheet pan there and it worked out well. Some pieces did stick together but only a bit so it was easy to get them apart. Note: Some people line their pan with foil so that the clean up is easier. For whatever reason, I always forget to do this. I soak the pan with hot soapy water for a bit and then use a stainless steel scourer (great for metal that does not have a non-stick coating) and the mess comes off really easily. Fourth, and this is really critical, drain off the fat as you go. Peek into the oven after about 7-10 minutes. There will probably be a little bit of fat in the pan. Maybe more towards the 10 minute mark. Drain it off into a bowl (be careful, it’s really hot!). Tilt the pan over a bowl so that the oil can pour off, but so that the bacon doesn’t go sliding off the pan. Then check on the bacon every few minutes. If there’s fat accumulating, get it out of there. Why is this? You might think that bacon swimming in hot fat would fry it more and thus crisp it up more. Instead, it seems to act more like water than fat and keeps the bacon soggy. Not good. You want the bacon exposed to the hot air in the oven because that is what crisps it up. Fifth, when the bacon’s ready, get it off of the pan immediately. You don’t want it to start steaming. 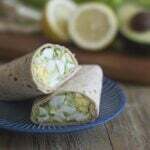 You want it cooling a bit because cool is crisper. The room temperature air seems to dry/cool the fat and make the bacon crisp up more. Transfer the bacon to a plate lined with paper towel. 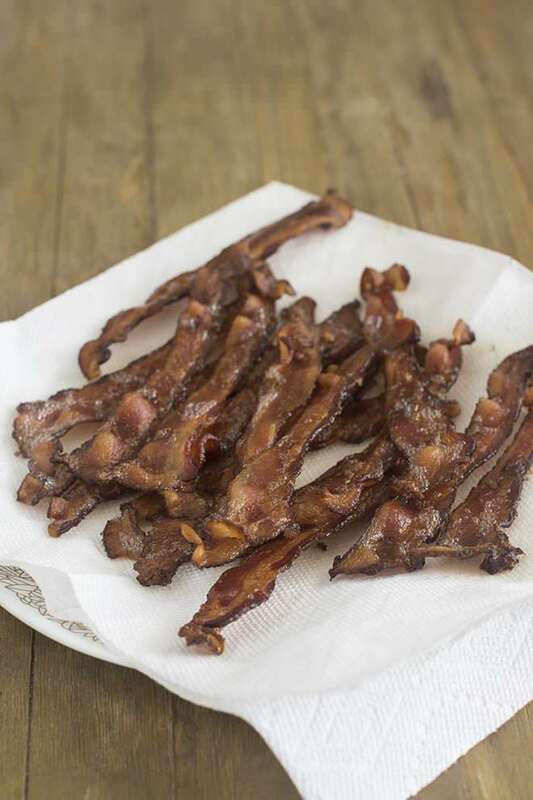 This absorbs some of the fat, drying the bacon and thus adding to that crisp-factor. 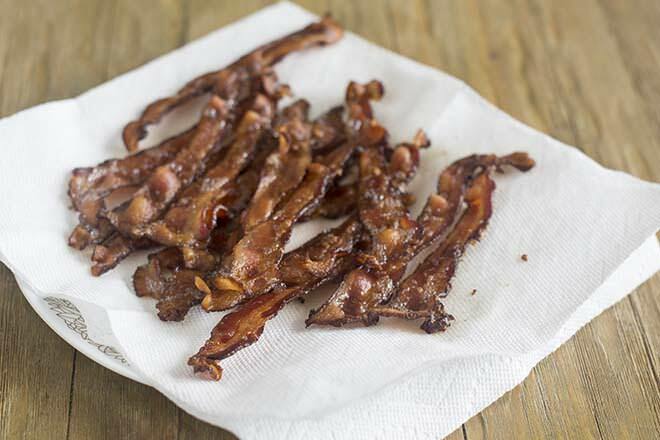 Finally, consider using a cooling rack on your pan when cooking the bacon. You get out a large baking sheet and top it with a cooling rack. Make sure it’s an oven-safe cooling rack like this. Some have a coating that makes them not good for putting into the oven. Put the bacon in a single layer on the rack. 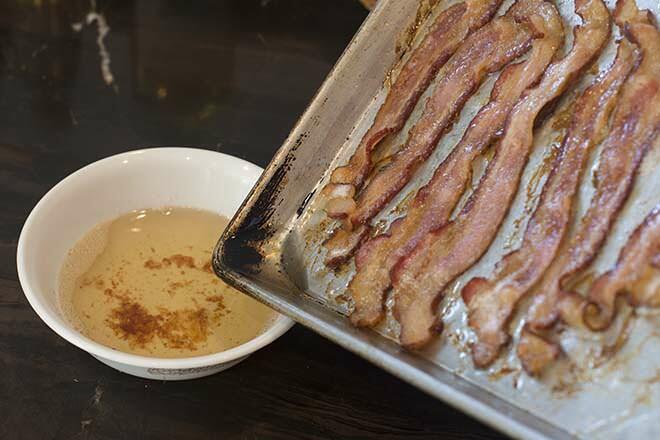 When the bacon goes into the oven, it will be exposed to air from all around which will result in extra crispness. Note however that I don’t do this. I find the rack makes too small a difference for the annoyance of having to clean it after. If you’re not immediately ready to serve the bacon and want to keep it warm, you can put it into a 200F oven for up to 20 minutes. First, take it off of the pan it was cooked on and onto a plate or a clean pan lined with paper towel as explained above. If your plates are oven-safe (these are my favorite oven-safe plates) then you can use one of those. Otherwise use a pan lined with paper towel. There you go: Crispy bacon in the oven. Feel free to print out the instructions in the recipe below. Have a great day! Cook an entire package of bacon (or more!) with very little effort. This method gets it nice and crispy. Perfect for a crowd. 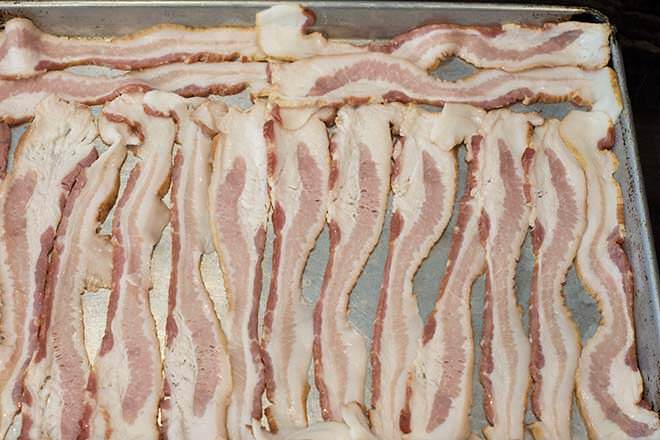 Arrange bacon on 1 or 2 large baking sheets in a single layer so that slices are not overlapping. Bake for 7-10 minutes. Drain off fat into a bowl. Cook until crisp, another 5-10 minutes, draining off fat whenever some accumulates. 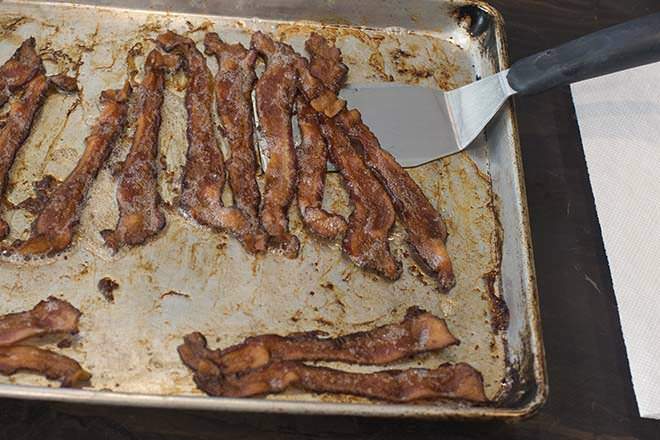 Transfer bacon to a plate lined with paper towel. Line sheet pan with parchment paper to prevent sticking. Luigi, Does it still get crispy? Thanks! I never made this before. Your Bacon looks very spicy. I want to make this at home. The instruction seems very easy to understand.